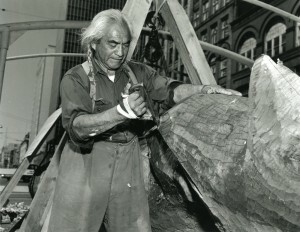 Hillaire carving the pole for Kobe, Japan, in Seattle’s Pioneer Square, 1961. Photograph by Harvey Davis. Post-Intelligencer Collection, Museum of History and Industry. 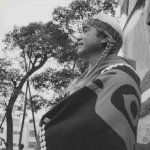 Joe Hillaire Kwul-kwul-tu, (meaning “spirit of the war club”) was a man of indomitable spirit, grace, intelligence, and talent. 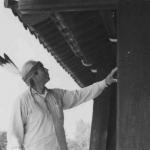 For his Lummi people, he perpetuated song and dance traditions through the Setting Sun Dance group, was instrumental in reviving the Lummi Stommish water festival (and Chief Seattle Days at Suquamish), taught totem carving and canoe-making, and was a voice for social and political causes. 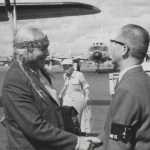 Of parallel importance were his actions as a liaison between Native and non-Native people. 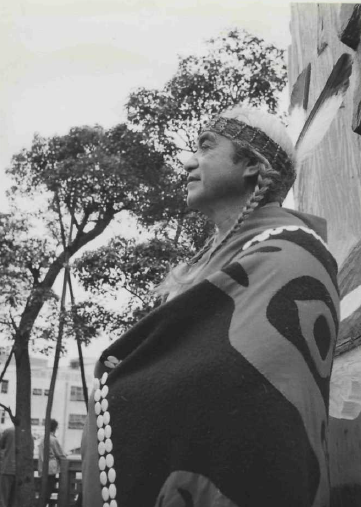 He imparted knowledge of Lummi heritage to anthropologists Bernhard J. Stern and Erna Gunther (curator of the Northwest Coast Native exhibit at the 1962 Seattle World’s Fair) and ethnomusicologist Willard Rhodes, as well as to the Boy Scouts of America and various school groups in the Seattle region. 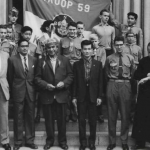 Hillaire also provided guidance to business and civic leaders, and traveled throughout the U.S. and to Japan with the objective of fostering inter-cultural friendships and bringing attention to Native culture. 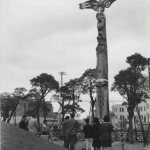 Totem pole carved by Joe Hillaire, Kobe, Japan, 1961. Photograph by Lawrence Denny Lindsley, 1967. 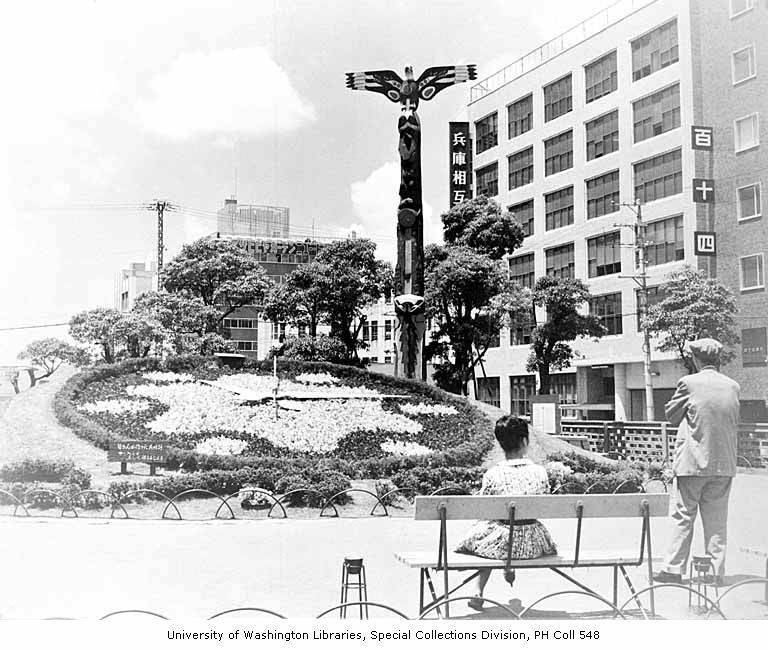 University of Washington Libraries, Special Collections Division. 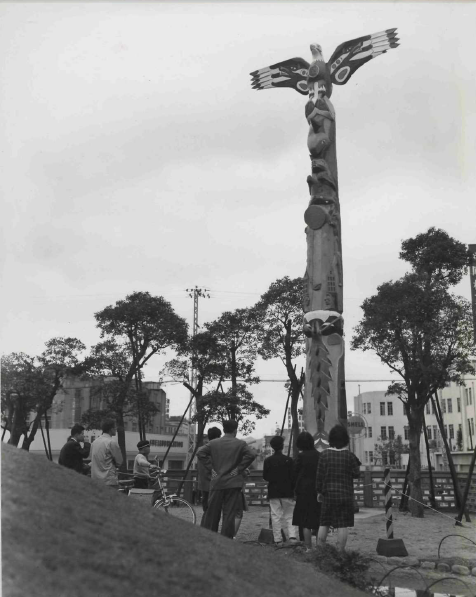 The 35-foot-tall pole depicted in the image to the right was carved by Hillaire in 1961 as a part of a two-pole project to call attention to the upcoming 1962 World’s Fair in Seattle. 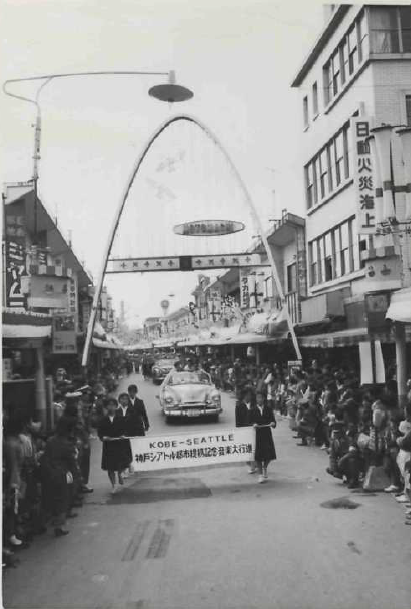 Kobe is Seattle’s sister city and the story pole was a goodwill gift meant to point out commonalties between the two cities, ease the memories of WWII, and promote trade between the U.S. and Japan. Hillaire’s approach is richly symbolic: two sisters grow closer as they acknowledge the things they share, like the salmon, mountains and sea, and the rising sun (Japan) and setting sun (Seattle). The monster blowing a dark cloud symbolizes the darkness of war, while the sun alludes to the hope of peace. 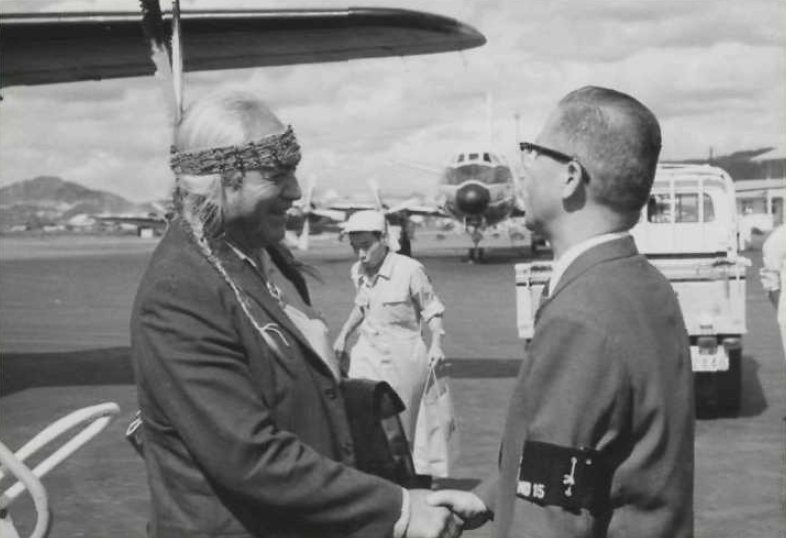 Mr. Koyama, Chief Foreign Affairs Officer, greets Joseph Hillaire at the Airport. Image courtesy of The Seattle Public Library. 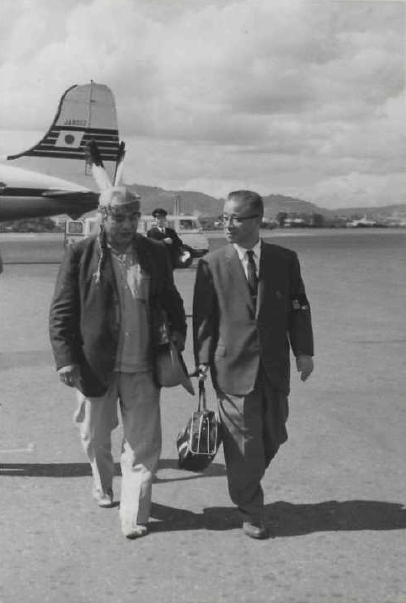 Mr. Koyama, Chief Foreign Affairs Officer, meets Joseph Hillaire at the Airport. Image courtesy of The Seattle Public Library. 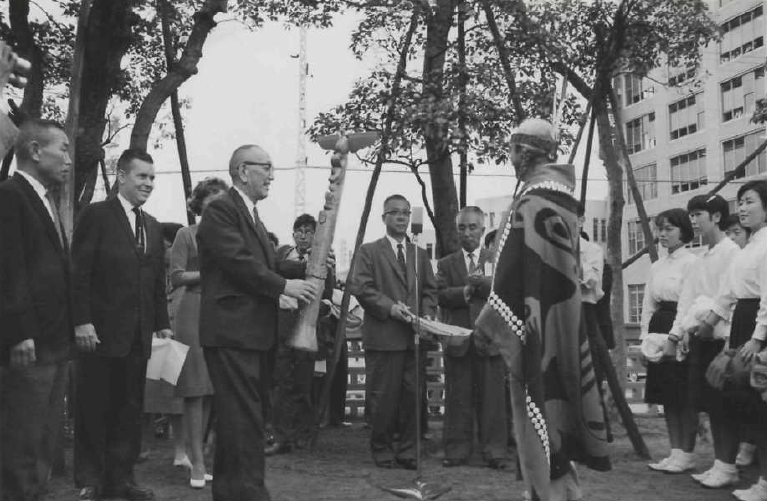 Joseph Hillaire presents model totem pole to Major Haraguchi. Image courtesy of The Seattle Public Library. 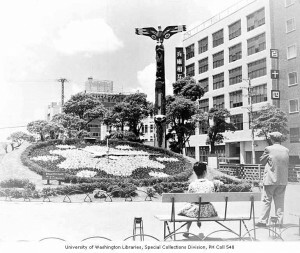 Joseph Hillaire Carving Kobe-Seattle Sister Friendship Pole in front of Kobe City Hall. Image courtesy of The Seattle Public Library. Joseph Hillaire Carving in front of Kobe City Hall. Image courtesy of The Seattle Public Library. 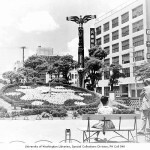 Kobe-Seattle Sister City Friendship Pole. Image courtesy of The Seattle Public Library. 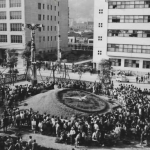 Crowd of people watching the dedication of the Kobe-Seattle Sister City Friendship Pole in Kobe, Japan. Image courtesy of The Seattle Public Library. 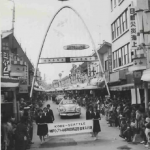 Joseph Hillaire towards end of Kobe-Seatle Sister City Friendship Pole dedication ceremony in Kobe, Japan. Image courtesy of The Seattle Public Library. 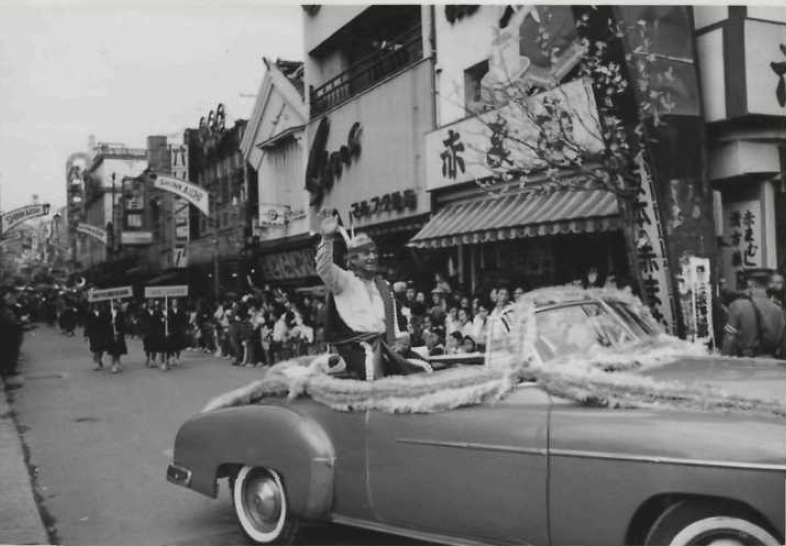 Parade featuring Joseph Hillaire travels through Motomachi Street . Image courtesy of The Seattle Public Library. 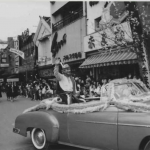 Joseph Hillaire responds to cheers from Parade spectators. Image courtesy of The Seattle Public Library. 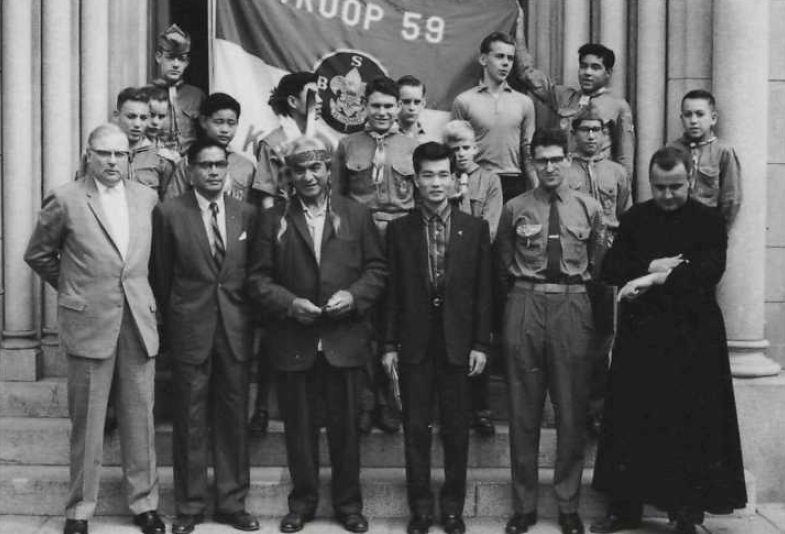 Joseph Hillaire with an American Boy Scout troup. Image courtesy of The Seattle Public Library. 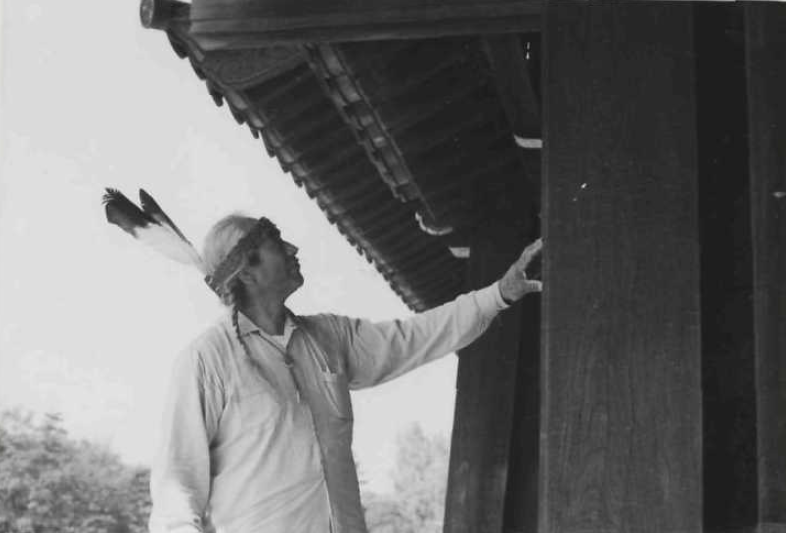 Joseph Hillaire stands next to pillar in Kobe, Japan. Image courtesy of The Seattle Public Library. Lummi artist Joseph Hillaire was commissioned to carve two story poles in connection with the 1962 Seattle World’s Fair. 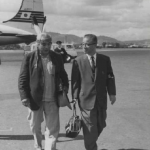 In celebration of its 50th anniversary, we are remembering Hillaire’s contributions to the Century 21 Exposition in a series of weekly posts. 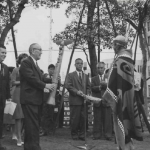 Please check back each week or subscribe to our RSS to learn more about Joseph Hillaire and the Saga of the 1962 Seattle World’s Fair Totems. 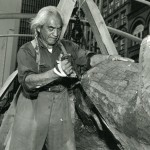 Top Photo: Hillaire carving the pole for Kobe, Japan, in Seattle’s Pioneer Square, 1961. Photograph by Harvey Davis. Post-Intelligencer Collection, Museum of History and Industry. Iskra Johnson, like most of us, navigates the territory between the natural and the modern world. She has a successful business providing custom letterform solutions and logotypes for packaging materials for companies looking to personalize their branding aesthetic. That Gardenburger logo? She created it. The Seattle Times brandmark? It’s in her portfolio. She utilizes many channels of modern technology (as one must be to survive in the current communications arena) working with design software, digital cameras and a smart phone as well as her website, blog and Facebook pages, all duly updated to maintain relevance with today’s desire for immediacy and attainability. While maintaining her life as a savvy business owner, Johnson works with equal diligence in her fine art career. And perhaps by proximity to (her studio is in the middle of a garden) the seasonal changing of flora and fauna, she is greatly inspired by her natural surroundings. Images of flowers, leaves, water and wildlife are featured in her work and layered with atmospheric shadows and textures. Each composition is carefully crafted, integrating digital photographic elements with older analog prints, powdered pigment and paint. Employing a unique transfer process, each print is handmade and sensitive to timing, humidity and pressure. It takes a great deal of repetition and attention to detail to produce one successful print. To some this could be considered time consuming and exhaustive, but to Johnson it is a process that allows for pause, contemplation and absorption. Come see new work by Iskra Johnson as well as artists Tyler Boley, Nichole DeMent, Eva Isaksen, Christopher Perry, Aithan Shapira, Nina Tichava and Allyce Wood in the upcoming exhibition, Contemplating Nature, open May 10 – June 9. Meet the artists May 10, 5 – 7 pm, for the opening reception at SAM Gallery, 1220 3rd Avenue (at University), downtown Seattle. Wild Plum, Iskra Johnson, transfer print on paper, 33×25 in. Your Last Chance to See Gauguin & Polynesia! 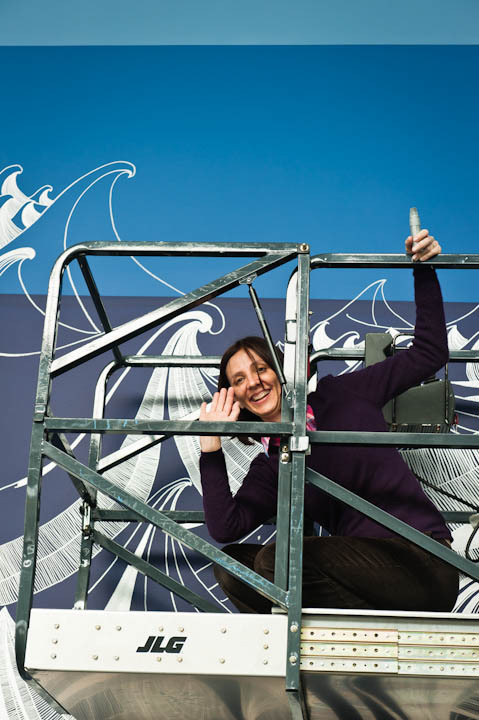 Brazilian artist Sandra Cinto is bringing a literal sea change to the Olympic Sculpture Park. 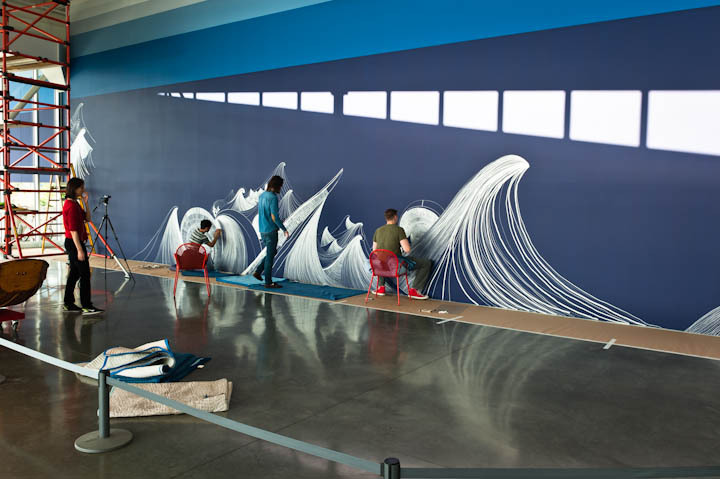 At the beginning of April, Cinto and two assistants started work on a site-specific installation titled Encontro das Águas (Encounter of Waters), an expansive wall drawing in the park’s PACCAR Pavilion. In addition to her two assistants, Sandra wanted to involve people from SAM’s community, so 20 volunteers and three SAM preparators have helped complete the piece. The Seattle Art Museum unveils Brazilian born, São Paulo–based artist Sandra Cinto’s site-specific installation for the Olympic Sculpture Park’s PACCAR Pavilion. 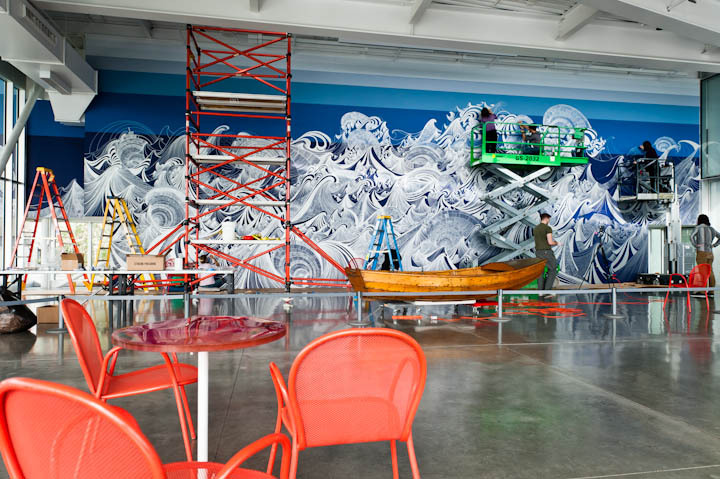 Influenced by artists as diverse as Sol LeWitt and Regina Silveira, and the woodblock prints of Japanese artists including Katsushika Hokusai, Cinto’s Encontro das Águas (Encounter of Waters) includes an intricate wall drawing, whose ambitious proportions convey a mesmerizing view of an expansive waterscape. Through humble materials—including blue paint and a silver paint pen—Cinto works directly on the wall and transforms a single line, repeated at different angles and lengths, into a titanic image of water that expresses both renewal and risk. As a counterpoint to this unbridled seascape, Cinto incorporates stories about individuals who were rescued at sea, to show the endurance of the human spirit in difficult circumstances. Cinto’s work has been shown internationally, including Argentina, France, Portugal, Spain and the United States. 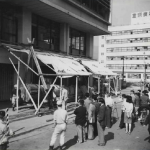 She was included in the XXIV Bienal Internacional de São Paulo, in 1998; Elysian Fields, a group show at the Centre Georges Pompidou, Paris, in 2000; TRANSactions: Contemporary Latin American and Latino Art, High Museum of Art, Atlanta, Georgia, in 2007–08; and the second Trienal Poli/Gráfica de San Juan: Latin America and the Caribbean, San Juan, Puerto Rico, in 2009; among other solo and group shows. She is represented by Casa Triângulo Gallery, São Paulo, Brazil, and Tanya Bonakdar Gallery, New York. 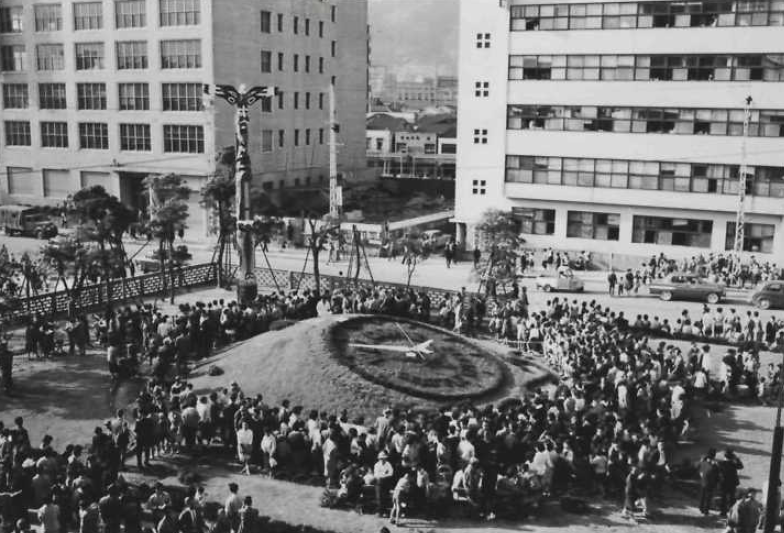 Encontro das Águas will be on view at the Olympic Sculpture Park’s PACCAR Pavilion April 14, 2012 to April 14, 2013. Here’s a guest post by Maddie Thomas, of SAM’s Teen Advisory Group! Three years ago I was strolling through SAM’s Olympic Sculpture Park and saw a poster for an event called “Art Attack – Teen Night Out.” The title of the event seemed appealing, but the poster design is what really caught my attention: an abstract, romantic depiction of a teenage Rapunzel-esque girl with billowy swirls of hair. Fascinated by the uniqueness of the occasion’s advertisement, I marked my calendar with the date and time and was excited to attend. 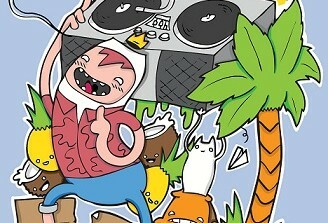 I had only been to the SAM a handful of times before and loved it, so going to a teen focused event there seemed great. There was only one problem. Three years ago also marked my first year of high school. As a freshman I was fairly timid. I’d grown up loving art but none of my friends at the time were artistic. I couldn’t think of anyone to invite who would appreciate the event. The evening Teen Night Out rolled around, I didn’t end up going. I was too scared attend an event of that scale on my own and never found anyone to go with me. Filled with regret, the following summer I checked SAM’s website to see if there were any other upcoming teen events. I realized Teen Night Out only happens twice a year, once in fall and once in the spring. But while browsing the website I discovered a teen program at the museum called the Teen Advisory Group (TAG). The website described TAG as a group of teen leaders who were “highly opinionated, creative, visionary, loud, committed, etc.” It also revealed that TAG did the planning for Teen Night Out! Mystified, I immediately filled out an application for the program online. A few months later as a sophomore, I got an email informing me about an approaching meeting for teens who were interested in the program. I attended the meeting, and a few other interviews, then received a confirmation email saying I’d been accepted into the program. I was ecstatic! At the very first meeting, I felt an energy and common ground with the other teens in TAG I had never experienced before. Everyone seemed united. Even though there were over 20 of us, we all had mutual creative interests and a strong appreciation for art. 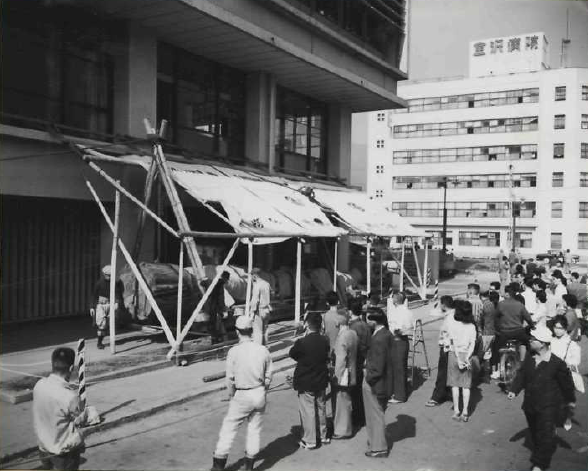 Additional meetings and various “ice-breaker” games revealed that we shared even more collective interests. I was finally making up for the lack of artistic friends that I had freshman year. Making new friends was a definite bonus of TAG, but it wasn’t why we were there. Members of TAG get to interact with the community through volunteering at local events, be creative with art activities and occasional lessons from SAM Teaching Artists, and are granted opportunities to meet and interview artists. While the Nick Cave: Meet me at the Center of the Earth exhibition was at the SAM, TAG members got a preview of the exhibit. Three days before it was open to the public, Nick Cave himself came to the museum and gave us a personal tour of his work. The tour with Nick was stunningly intimate; wet paint signs covered the walls, various sculptures still needed to be unpackaged and assembled. The raw version of the exhibit was the most fascinating time I viewed that show (I probably saw it over 20 times): I never had been part of something so exclusive. SAM provides amazing opportunities for teens, that moment in the galleries with Nick being a fine example. Though volunteering and special opportunities are wonderful, the major focus of the group is curating Teen Night Out. I’m a junior this year. I have returned for a second year to be part of TAG, and I’m currently in the process of helping to plan our next Teen Night Out on Friday, April 13. 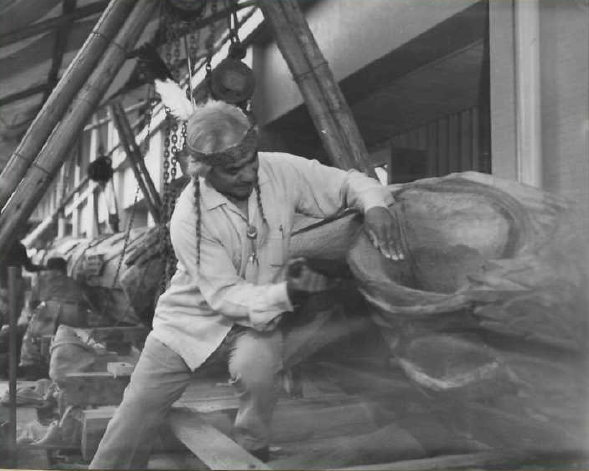 The event is being organized to show off the museum’s special exhibition: the fabulous Gauguin & Polynesia, as well as showcase local musicians, dance groups and artists. The focus of the event will be to bring teens into the museum and prove that SAM breaks traditional museum stereotypes: the notion of museums being boring places with stuffy security guards telling you not to touch things. That image doesn’t fit SAM in any way. SAM is a friendly, modern, energetic museum full of diversity, which will be showcased at Teen Night Out. As an efficient way to plan for Teen Night Out, we’ve divided our TAG group into specific committees to focus on individual elements of the event. These committees include: promotion, tours & event operation, interactive activities, and performance. I am on the performance committee and will be stage managing the event with my fellow TAG member Chris Cosby. Stage managing will give me the chance to interact with the performers by helping them load in, make them comfortable in their green room spaces, make sure all goes well with sound checks and set up, as well as load out. I stage managed during last year’s Nick Cave focused Teen Night Out; it can be rather stressful, but I know everything will go smoothly this year with help from Chris. Looking forward to the upcoming event has also caused me to reflect on my entire experience with TAG so far and how much I’ve changed. Being a member of TAG has boosted my self-confidence tremendously. I’m now a better leader and more efficient when working with a team. At our weekly meetings I’m exposed to a wide range of perspectives, which has helped me grow as a person and look outside of myself. Though I get the added bonus of service learning hours for school through TAG, my main motive for being a member is to participate in new experiences. I especially valued being a summer counselor at SAM Camp, and speaking at an Art Education Forum this past March with Mayor McGinn and other passionate youth. Being a TAG member has further increased my interest in the art world. I would love to be on a public relations or marketing team for an art museum someday. Most importantly, thanks to SAM I’m no longer that timid little freshman who felt like she had no artsy friends and was afraid to speak up for herself. I am now a powerful junior with a bright and creative future ahead, and enough confidence to inspire other teens to get involved. TASTE Restaurant at SAM has translated the vibrancy of Gauguin & Polynesia: An Elusive Paradise into flavors! The modern, fresh and artistic restaurant is furthering the experience of the exhibition with their new exhibition-inspired menu. In designing the menu, Executive Chef Craig Hetherington sought to evoke bold, individual flavors while upholding TASTE’s mission of using the best local ingredients. With no more than five or six ingredients per dish, each choice reflects the vivid yet simplistic character of Gauguin’s work. Instead of simply serving Hawaiian food, Hetherington added Polynesian flair to fine local ingredients for a refined interpretation of island cuisine. The Gauguin-inspired dinner experience begins with a selection of small plates. The St. Jude Albacore Poke is a traditional Tahitian dish highlighting flavors of soy, vinegar and ginger. Another excellent choice is the House Made Spam, crafted from locally raised pork loin and shoulder. The plate offers a sophisticated twist on musubi, a traditional island treat. The Seared Qualicum Beach Scallops is the perfect entrée to complement the exhibition. In designing this dish, Hetherington drew inspiration from Gauguin’s French roots as well as his travels in Polynesia. A distinctly European chevre potato purée meets the tropical taste of pickled ginger on the plate. TASTE offers special menu choices based on seasonal offerings. Hetherington creates flavors with fresh market fare; a recent special was Mahi Mahi with Spicy Pineapple and Browned Butter. The Rum Cake is the perfect sweet ending to a Gauguin-inspired dinner. Made with fresh pineapple, mango, kiwi and papaya, and topped with mascarpone cream, this dessert is tantalizing and tropical. Bring your GO! Gauguin coupon to get a free Rum Cake! 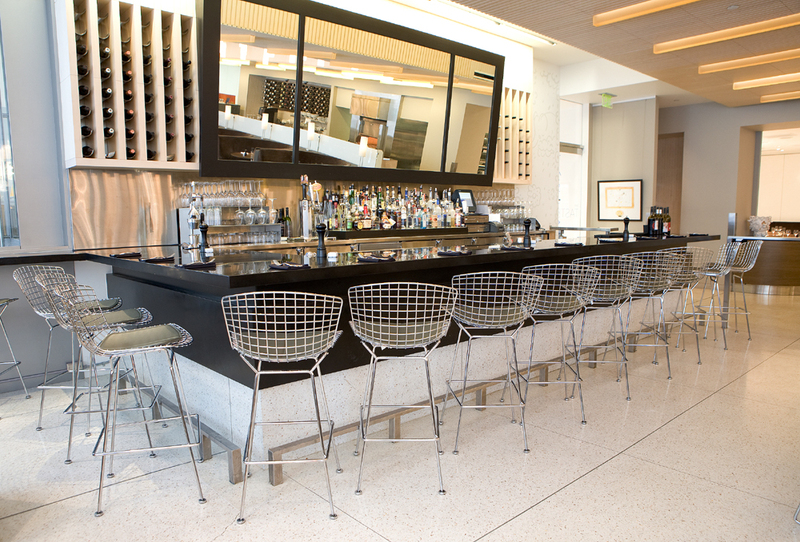 If you can’t make it to TASTE for dinner, stop by for lunch or happy hour! The Lunch menu offers Grilled St. Jude Albacore. Like the scallops, this selection combines French and Polynesian fare with a soy and truffle reduction. Kahlua Pork Sliders are featured for happy hour and are served with a green papaya slaw. Visit TASTE to extend your Gauguin & Polynesia experience and taste the flavors of the exhibition. Visit www.tastesam.com for more information. Reservations | 206.903.5291 | GIFT CERTIFICATES AVAILABLE! The exotic flavors and colors associated with Gauguin & Polynesia: An Elusive Paradise have inspired bartenders around town to create special exhibition drinks. This Friday night, enjoy a Polynesian-influenced libation with your GO! Gauguin coupon! SAM is hiding two Gauguin & Polynesia tickets at one of these partner locations. At noon today on Facebook and Twitter, we will reveal a clue for the location of this hidden pair of tickets. The first person to reach the location and say, “Go Gauguin!” wins the tickets. The following restaurants all have special Gauguin & Polynesia cocktails. 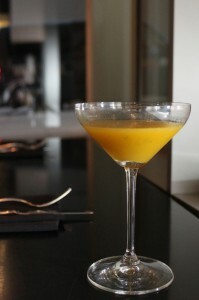 Tweet a picture of your cocktail tonight to @iheartSAM! At SAM Downtown, 1300 First Ave. If you’re already at the museum, present your GO! 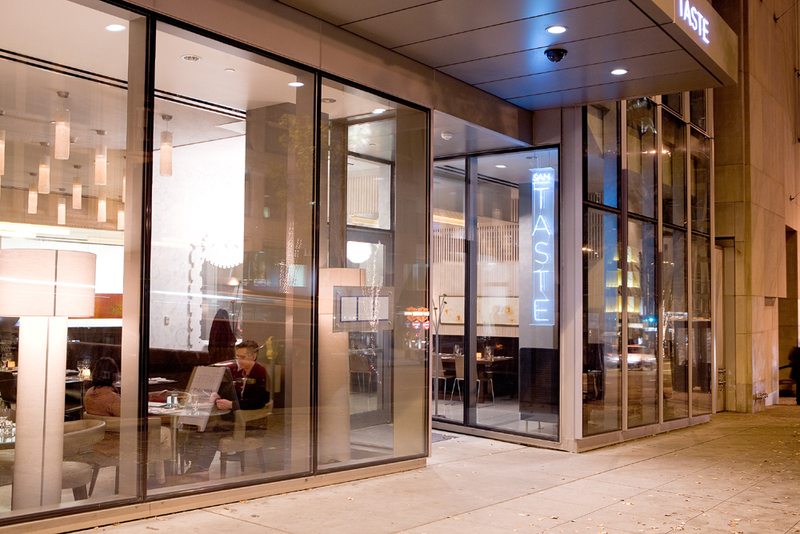 Gauguin coupon while dining at TASTE to receive a complimentary exhibit inspired dessert. Cannot be combined with other offers or discounts. 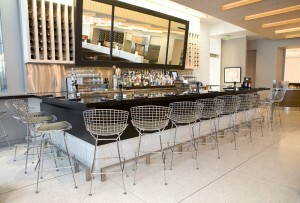 Come on down to Lecosho – just a stroll away from SAM on the Harbor Steps – and receive 15% off your bill with your GO! Gauguin coupon. You may also enjoy The Gauguin, a special Polynesian-inspired cocktail, for only $5. Not valid with other offers, discounts or during happy hour. Present your GO! Gauguin coupon during happy hour from 4–7 pm for a Polynesian-inspired cocktail at the Bookstore Bar or take 10% off your food bill in the Library Bistro Monday–Friday, 11:30 am–2:00 pm. Cannot be combined with other offers or discounts. Dine at Marché located in Pike Place Market and delight in their special Gauguin-inspired menu items. Enjoy the Pousee au Crime cocktail, which means “the drink made me do it,” an intoxicating blend of French agricole rhum shot with cane sugar and lime juice for $8. Or try the Tahitian vanilla bean pot de crème with huckleberry conserve for $7. Satisfy your taste palette with a discounted, special Polynesian-themed appetizer and cocktail when you present your GO! Gauguin coupon at Wild Ginger Asian Restaurant & Satay Bar. Cannot be combined with other offers or discounts. No substitutions. On Thursdays and Fridays, SAM is open until 9 pm. So spend a night at the museum and have dinner before or after your visit to Gauguin & Polynesia: An Elusive Paradise. A variety of Seattle restaurants are offering special menu items and discounts. To take advantage of these deals, simply print out your GO! Gauguin coupon. Please present your GO! Gauguin coupon for dinner and enjoy 15% discount on your entire food purchase. Offer cannot be combined with any another discounts or promotions. Come see Gauguin & Polynesia at the Seattle Art Museum and present your ticket stub or GO! Gauguin coupon to enjoy 15% off your bill at Fonté Café & Wine Bar located just across the street from the museum. Cannot be combined with other offers or discounts, not available at happy hour. GO! Gauguin and save at Gordon Biersch, conveniently located in the heart of downtown at the Pacific Place Shopping Center. Present your GO! Gauguin coupon to enjoy 20% off your entire bill. Hungry? Short on time? Hurry on in with your GO! Gauguin coupon and treat yourself to a scrumptious Curried Chicken Salad or a delightful Hawaiian Pizza for a special art-lovers price of just $4.95. Open Monday–Friday from 11 am–2 pm. In honor of the exhibition, Harried and Hungry will be presenting Polynesian-inspired works by local artists on their walls starting in February, so you can bask in the ambience of the tropics while enjoying lunch. Present your GO! Gauguin coupon at Il Fornaio at the Pacific Place Shopping Center for a complimentary appetizer or dessert with the purchase of an entree. Offer valid in the Cucina or Risotteria during the exhibition period. Cannot be combined with any other offer or discount. Just a hop and a skip away from SAM, at the corner of First Avenue and Union Street, Japonessa offers a 20% discount off your next bill when you present your GO! Gauguin coupon. Not eligible for happy hour items. Cannot be combined with other offers, discounts or promotions. At Mexico Cantina y Cocina, located in Pacific Place, you can redeem your GO! Gauguin coupon to enjoy a complimentary appetizer or dessert of your choice with the purchase of one entrée. Cannot be combined with other offers or discounts. Present your GO! Gauguin coupon at the Pike Pub for your choice of $2 off of a Pike Pint, $4 off of a Pike Pitcher, or 15% off of their merchandise. The Pike Brewing Company is a gravity flow brewery, brewing fine ales and serving a local and sustainable menu. Located on the corner of First Avenue and Union Street, right across the street from SAM. Enjoy a beer before or after the museum. Offer not available during Hoppy Hour, Monday–Friday, 4–6 pm. GO! Gauguin at the Musicquarium Lounge when you present your coupon and receive 15% off your bill during Gauguin & Polynesia. Named for its stunning 1,900 gallon freshwater aquarium, the Musicquarium features live music and entertainment most nights of the week. Cannot be combined with other offers or discounts, not valid during happy hour. Located at The Triple Door on the corner of Third Avenue and Union Street. Join us at SAM Downtown on Saturday, March 10 for a fun-filled celebration of French Polynesian art and culture that the whole family can enjoy. 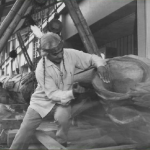 The first 400 people in line at Hammering Man at 10 am will receive free tickets to Gauguin & Polynesia: An Elusive Paradise! These are timed tickets, which means that they are for various time slots throughout the day. Please proceed to the Gauguin & Polynesia gallery entrance on the 4th floor 10–15 minutes prior to the time listed on your ticket. Community Day activities include art making, tours, dancing and live music. 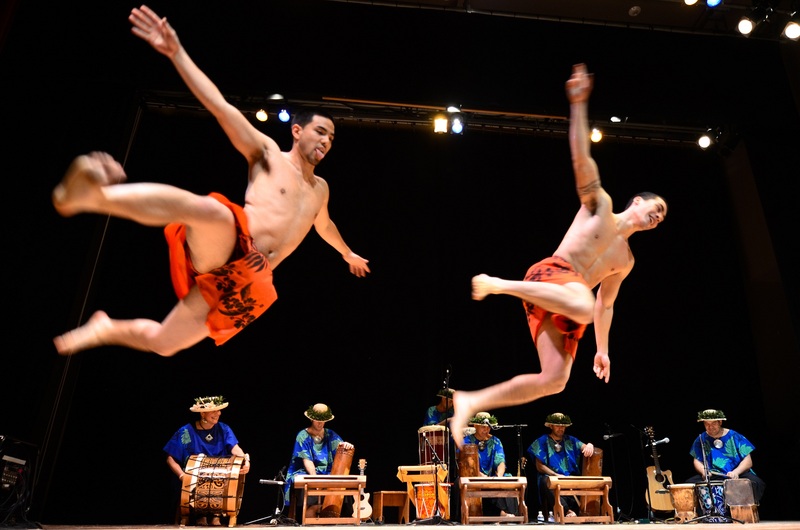 Experience the power and beauty of Tahitian dancing and drumming performances by Te’a rama, including a Marquesan haka (a Polynesian traditional welcome) with performances at 10:30 am and 1:45 pm in South Hall, and 11 am and 2 pm in the Plestcheef Auditorium. Enjoy French café music by Rouge in South Hall at 12:30 pm. Take French lessons from the French Immersion School of Washington and the French American School of Puget Sound. Participate in all day art making activities will include: paper leis, Polynesian-inspired printmaking, tiki masks, mixed media postcards, and landscape pastels. Learn Polynesian dances with a lesson from Na Hanu `O Ku`uleialoha at 12 pm in the Arnold Board Room.